Wow. This article, by one of the founders of Women of the Wall, speaks of their true goal, and is so utterly offensive it is ridiculous. It also forever puts to bed the nonsensical claim that the Women of the Wall simply wish to pray, and have no intent of presenting their Judaism as superior to that practiced by the traditional Jews already there. But the reason I highlight this is because the comments on it are unbelievably amazing. I wanted to share two of my favorite ones. Your article really bothers me. Much more than many of the ridiculous inordinate amount of space in the “news” that has been given to writers articulating the position of WOW. Over, and over again. You have a right to feel how you do, and to express it freely. But what bothers me is “This represents a revolution in haredi lives. That is why they fear and resist it. 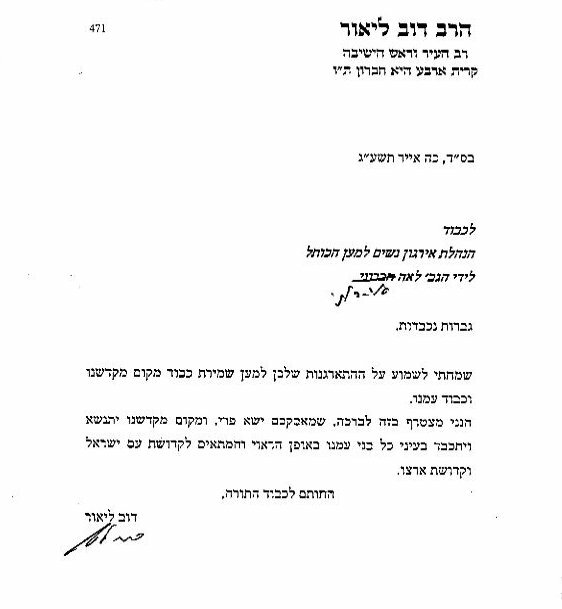 Their women will be influenced, strengthened, perhaps even demand change from their rabbis.” It is not your right to presume and impose on Haredi women your sense that they want a revolution, are oppressed, don’t choose their life, and PREFER it to your value system. It is condescending and disrespectful, precisely what you don’t want done to you. In addition, to say that “When haredi women, and haredi men, and haredi children see women leading services, wearing tallitot, and even handling and reading from Torah scrolls, their world view is changed.” is equally presumptuous on your part. Hareidim know it exists. It is disruptive to their prayer in a sacred space, it is something that bothers most of them but it isn’t “new to them.” You aren’t expanding their horizons, and it suggests that they are only hareidi because they “just don’t know any better”. How colonialist of you. They don’t need you to civilize them, educate them on the new and better way. It is one thing to articulate your desire for freedom of religious expression. Whether I agree that WOW is choosing the right time and place to express that desire is completely irrelevant. But to presume that your political activism which is NOT about klal yisroel, the majority, the most inclusive, but rather about MY rights as an individual, what I want and what I am denied, is somehow doing Hareidim a favor? And one more point: Women having a different role in Judaism than a man’s role does not by definition mean “centuries of deprivation, of secondary status”. That is YOUR truth, not universal truth. I think this shows the real point of the matter. They deny that Haredi women are doing something because they want to and demand that they be “liberated”. I would put any amount of money on it that if Orthodox Women voluntarily gave up he women’s section forever to the WOW and went to Robinson’s Arch to be left alone to pray in their way the WOW would demand that they be allowed to Daven their “way” at Robinson’s Arch. It is really sad to see that, as Jews, we spend so much time trying to “save” other Jews from themselves. I could really care less if the WOW get their own section at the Kotel so they can parade around in Tefillin and Talits. I do find it funny that when they are justifying doing it they claim their actions are Halachically appropriate but in all other aspects of life they could care less about Halacha. WOW should worry about themselves and do what is right for them. They should not protest what they see as religious oppression by oppressing those women who disagree with them. 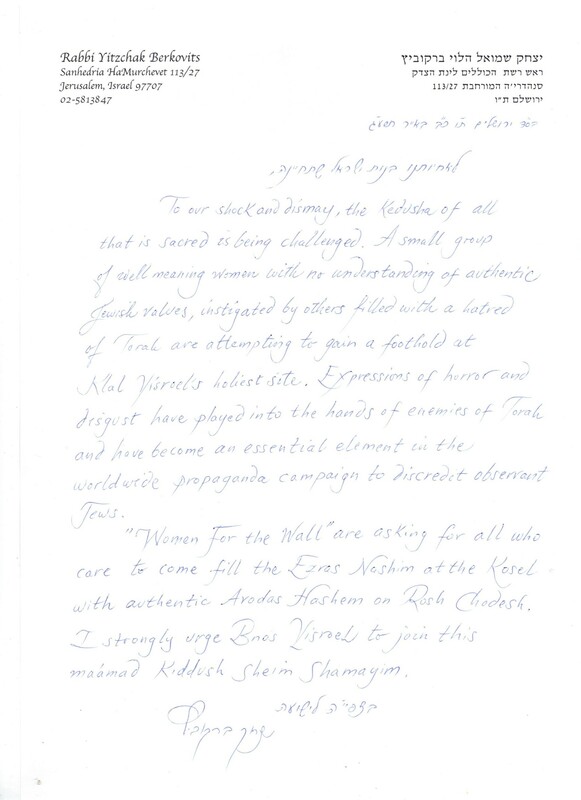 And if you’re wondering who, alone among the many unbiased readers profoundly uncomfortable with Aronoff and Haut’s article, praised the article and its writers as “magnificent,” “beautiful” and “wonderful” — well, those would be board members and other key supporters of Women of the Wall. The agenda has been laid out and made clear. Thanks os much for including my quote in this story. This issue is a big one for me. I wish there was more I could do to help you and this wonderful organization. Being an American, and growing up totally secular, I have seen first hand what the Reform movement is capable of. Please keep up the good work!